Compost in the garden is often called black gold, and for good reason. Compost adds an amazing amount of nutrients and helpful microbes to our soil, so it makes sense that you would want to make as much compost as you can in the shortest amount of time. Turning your compost heap can help with this. 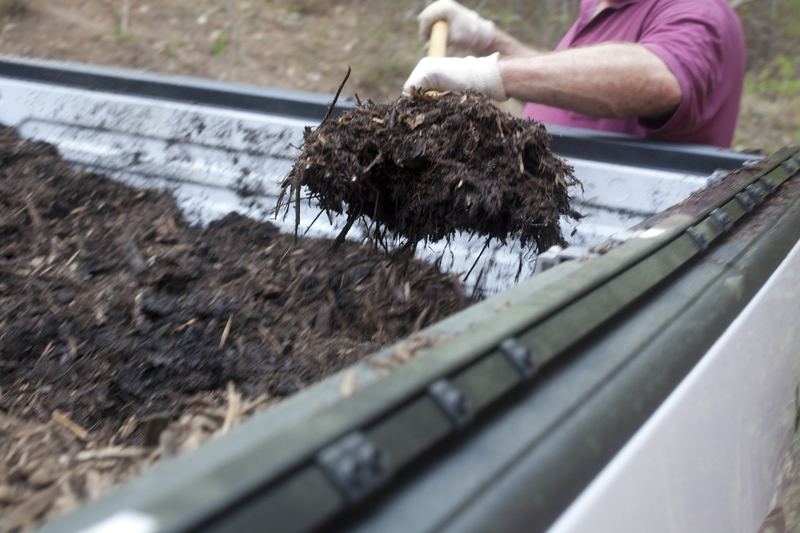 At a basic level, the benefits in turning your compost come down to aeration. Decomposition happens because of microbes and these microbes need to be able to breathe (in a microbial sense) in order to live and function. If there is no oxygen, these microbes die off and decomposition slows down greatly. Compaction – This is the most obvious way that turning can aerate a compost pile. When the particles in your compost get too close to each other, there is no room for air. Turning compost will fluff your compost heap and create pockets where oxygen can get inside the pile and supply the microbes. Too much moisture – In a compost pile that is too wet, the pockets in between the particles will be filled with water rather than air. Turning helps to drain away the water and reopen the pockets to air instead. Over consumption by microbes – When microbes in your compost pile are happy, they will do their job well — sometimes too well. The microbes near the center of the pile may use up the nutrients and oxygen they need to survive and then they will die off. When you turn the compost, you mix the pile up. Healthy microbes and undepleted material will be mixed back into the center of the pile, which will keep the process going. Overheating in the compost pile – This is closely related to over consumption as when microbes do their jobs well, they also produce heat. Unfortunately, this same heat can kill off the microbes if the temperatures get too high. Mixing the compost up will redistribute the hot compost in the center into the cooler outer compost, which will help keep the overall temperature of the compost pile in the ideal range for decomposition. For the home gardener, the ways to turn the compost pile are typically limited to either a composting tumbler or manual turning with a pitchfork or shovel. Either of these methods will work well. A compost tumbler is typically bought as a complete unit and only needs the owner to turn the barrel regularly. There are also DIY directions available on the Internet for building your own compost tumbler. For gardeners who prefer an open compost pile, a single compost bin can be turned by simply inserting your shovel or fork into the pile and literally turning it over, much like you would toss a salad. Some gardeners with enough space opt for a double or triple compost bin, which allows them to turn the compost by moving it from one bin to the next. These multi-bin composters are nice, as you can be sure that from top to bottom the pile has been thoroughly mixed. How often you should turn compost depends on a number of factors including size of the pile, the green to brown ratio and the amount of moisture in the pile. That being said, a good rule of thumb is to turn a compost tumbler every three to four days and the compost pile every three to seven days. As your compost matures, you can turn the tumbler or pile less frequently. Some signs that you may need to turn the compost pile more frequently include slow decomposition, pest infestations and smelly compost. Be aware that if your compost pile starts to smell, turning the pile may make the smell worse, initially. You may want to keep wind direction in mind if this is the case. Your compost pile is one of the greatest tools you have to make a great garden. It only makes sense that you would want to make the most of it. Turning your compost can make sure you get the most out of your compost pile as fast as possible.